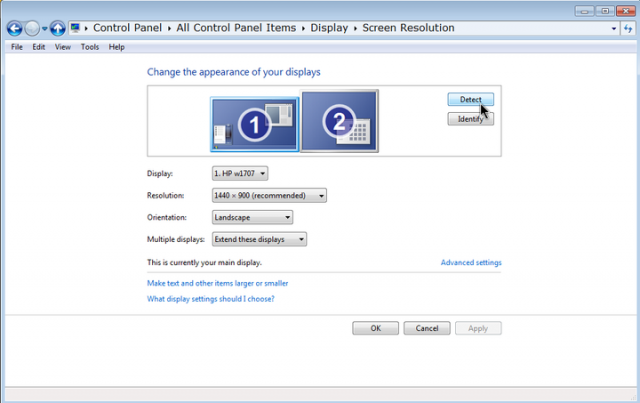 This has to do with an issue of hooking up a second monitor to your system, but no picture showing on the screen on one of your monitors. I’ve had this problem when setting up dual monitors before. I unplugged my second monitor and when I plugged it back in, the screen remained black. The solution is simple. 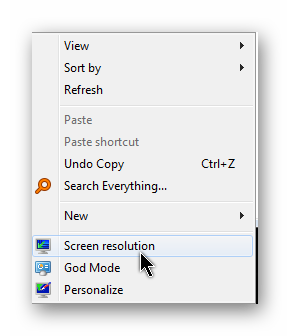 Right-click on your desktop, and click on Screen resolution. In the rectangular box that shows your monitor setup, on the right-hand side is a button labeled Detect. Just click on it. Usually, this clears up the problem. Another thing, at one time my monitor started displaying an odd resolution. Everything looked extra big on the screen. The resolutions were all set and adjusting them had no effect. Again, clicking on this Detect button solved that problem as well. The Identify button just displays a big white number on your monitors. Number 1 for the first, number 2 for the second, and so on. Prev:20% Of Windows Users Might Switch To Mac! Press win key + P together. Speaking of monitors, I have an HDMI monitor and a (Win 10 Pro) desktop PC with no HDMI port – it only has a VGA port. I can buy a cable with an 15-pin VGA connection on one end and an HDMI connection on the other end. Are there any other considerations I need to worry about? I bought one of these awhile ago and it didn’t work and the main consensus online is that these types of cables don’t work period. You apparently need some kind of converter – so search online for a vga to hdmi converter instead. Thanks – see my reply below to Dave. Vga is analog signal and hdmi is digital. This is the reason why it’s not compatible. You indeed need a converter to make it work. These don’t come cheap. Better buy an new monitor. Actually, on 1 of my PCs I did successfully connect my VGA port to an Samsung 32″ Smart TV’s HDMI port, with only the VGA-HDMI-cable and no converter. So maybe because it was a “smart TV” with an optional PC setting is how I got that to work? Also, I just discovered that my PC has a ‘display port’ [which is digital] so I think I’ll look into a DisplayPort-to-HDMI cable. What do you think?